Stele of Narâm-Sîn, king of Akkad, celebrating his victory against the Lullubi from Zagros. Limestone, c. 2250 B.C.E. The Akkadian Empire usually refers to the Semitic speaking state that grew up around the city of Akkad north of Sumer, and reached its greatest extent under Sargon of Akkad (2296-2240 B.C.E.). It has been described as the first true empire in world history. It was a flourishing civilization in one of the most fertile areas of the globe, the alluvian plain of Southern Mesopotamia that fed into the later Babylonian Civilization. Women appear to have been respected and to have played a significant role in the religious cultus. King Sargon was the first ruler to unite the peoples of Southern Mesopotamia into a single political unit. He established a strong, centralized state. Cities, though, used to independence competed for preeminence, which appears to have eventually brought about the Empire's decline. It was followed by the Babylonian Civilization. This is roughly in the region of modern Iraq. Comparatively little of what constitutes modern civilization may have been derived from the Akkadians but the Empire was an important bridge in the development of the culture, social organization and commercial practices of the region. The Akkadian language became the lingua franca for commerce and diplomacy throughout Mesopotamia until 1000 B.C.E. when it was replaced by the Babylonian language which was used throughout the entire Ancient Near East. Documents found in the last two centuries on cuneiform clay tablets have helped locate the Hebrew religion and culture in its wider, Mesopotamian context. International treaties survive, showing that there was an increased awareness of inhabiting a single world and that peaceful negotiation of difference, and trade, could enable all parties to prosper. The Akkadian civilization can be appreciated as a vital link in the chain of human progress, away from tribalism and local loyalties towards consciousness of wider, even of trans-national obligations. This was also a society that revered the 'sacred female,' a concept that in subsequent history has tended to be marginalized. Rulers with Semitic names had already established themselves at Kish. One of them, contemporary with the last Sumerian ruler, Lugal-Zage-Si, was Alusarsid (or Urumus) who "subdued Elam and Barahs." But the fame of these early establishers of Semitic supremacy was far eclipsed by that of Sargon I (Sharru-kin), who defeated and captured Lugal-Zage-Si, conquering his empire. A lengthy inscription of Sargon's son, Manishtushu, was discovered at Susa by J. de Morgan. The date of Sargon is placed by modern scholars around 2300 B.C.E. (although the later "archaeologist king" of Babylonia, Nabonidus, calculated it at 3800 B.C.E.). Sargon was the son of La'ibum or Itti-Bel, and one legend related how he had been born in concealment and set adrift in an ark of bulrushes on the waters of the Euphrates. Here he was rescued and brought up by "Akki the husbandman"; but the day arrived at length when his true origin became known. Originally a cupbearer to a king of Kish with a Semitic name, Ur Zababa, the crown was set upon Sargon's head, and he entered upon a career of foreign conquest. Four times he invaded Syria and Canaan, and spent three years thoroughly subduing the countries of "the west" to unite them with Mesopotamia "into a single empire." He appointed provincial governors, while cites had their own bureaucracies. Images of Sargon were erected on the shores of the Mediterranean Sea in token of his victories, and cities and palaces were built at home with the spoils of the conquered lands. Elam and the northern part of Mesopotamia were subjugated. Contract tablets have been found dated in the years of the campaigns against Canaan and Sarlak, king of Gutium (Kurdistan); and copper is mentioned as being brought from Magan (probably modern Oman). At one point, Sargon marched against Arabs in the south. His kingdom traded with India and Anatolia (Turkey). Sargon's two sons and successors, Rimush and Manishtushu, were not so illustrious, and both were assassinated; but his grandson, Naram-Sin (2213-2176), followed up the earlier successes by marching into Magan, whose king he took captive. He assumed the imperial title of "King Naram-Sin, of the four quarters," and, like his grandfather, was addressed as "the god of Agade" (Akkad), reminiscent of the divine honors claimed by the Pharaohs of Ancient Egypt. Sargon's heirs claimed to be “kings of the four corners of the world.” There was some internal disturbance due to cities resenting their loss of independence. 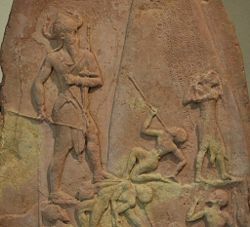 A finely executed bas relief representing Naram-Sin, and bearing a striking resemblance to early Egyptian art in many of its features, has been found at Diarbekr, in modern Turkey. Babylonian art, however, had already attained a high degree of excellence; two cylinder seals of the time of Sargon I are among the most beautiful specimens of the gem-cutter's art ever discovered. you destroy mighty lands with arrow and strength and overpower lands. The flood myth of Gilgamesh predates the Akkadian civilization but it was translated from Sumerian into Akkadian somewhere between 2000 and 1500 B.C.E. This has been compared with the flood narrative in Genesis. The stories are different, but the existence of several similar narratives suggests that some sort of a deluge may have occurred. The empire was bound together by roads, along which there was a regular postal service. Clay seals that took the place of stamps bear the names of Sargon and his son. A cadastral survey seems also to have been instituted, and one of the documents relating to it states that a certain Uru-Malik, whose name appears to indicate his Canaanite origin, was governor of the land of the Amorites, or Amurru as the semi-nomadic people of Syria and Canaan were called in Akkadian. It is probable that the first collection of astronomical observations and terrestrial omens was made for a library established by Sargon. Naram-Sin recorded the Akkadian's wars against the Armani or Armeni people in Ararat. The Armeni is a reference to Armen who was the ruler of the Armenian tribe (Armen's followers, the Armenians, were refered to as Armeni or Armens at the time). It is not known if Sargon, grandfather of Naram-Sin, and Manishtushu, father of Naram-Sin, also fought against the Armeni people of Ararat during their rule of the Akkadian Empire. It is highly probable however considering that Naram-Sin recorded multiple wars with the Armeni people of Ararat. It is not known at this time if war with the Armeni people of Ararat contributed to the collapse of the Akkadian kingdom. However, the Akkadian Empire was already starting to crumble during the reign of Shar-kali-sharri, the son of Naram-Sin, and by the end of his reign the empire collapsed outright from the invasion of barbarians of the Zagros Mountains known as "Gutians." Some speculate that a bad harvest, climactic change or even a giant meteor contributed to the decline. The fall of the empire established by Sargon seems to have been as sudden as its rise, and little is known about the Gutian period. From the fall of Akkad until around 2100 B.C.E., there is much that is still dark. A relatively well-known king from that period is Gudea, king of Lagash. The period between ca. 2100 B.C.E. and 2000 B.C.E. is sometimes called the third dynasty of Ur or "Sumerian Renaissance," founded by Ur-Nammu (originally a general). Though documents again began to be written in Sumerian, this dynasty may actually have been Semitic; Sumerian was becoming a dead language, much as Latin later would be in Medieval Europe. The power of these kings extended to the Mediterranean. After the fall of the Ur III dynasty owing to an Elamite invasion in 2004 B.C.E., Mesopotamia passed under foreign influence. This period is called Old Babylonian, and lasted from ca. 2000 B.C.E. until 1595 B.C.E. During the first centuries of this period, kings and people in high position often had Amorite names, and supreme power rested at Isin. The city of Babylon was given hegemony over Mesopotamia by king Hammurabi 1792 B.C.E. - 1750 B.C.E., famous for his law code. Much of Akkadian culture was incorporated into that of Babylonia. ↑ Inana and Ebih: translation The Electronic Text Corpus of Sumerian Literature. Retrieved July 29, 2013. ↑ Flood Traditions The Christian ThinkTank. Retrieved July 29, 2013. ↑ Akkadian-Hittite Treaty Jewish and Christian Literature. Retrieved July 29, 2013. All links retrieved November 4, 2016. The Akkadian Period (ca. 2350–2150 B.C.E.). This page was last modified on 4 November 2016, at 15:21.